A riveting and well written book that was hard to put down. It was well worth waiting for! 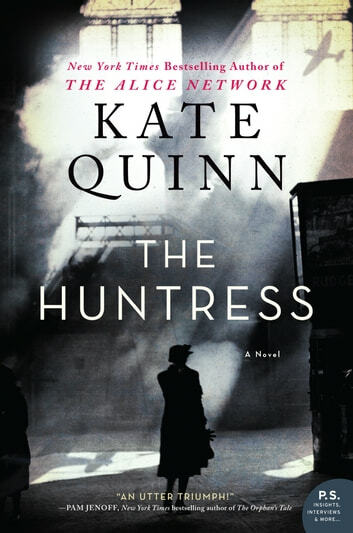 Kate Quinn really impressed me with “The Alice Network” and I could not wait to read "The Huntress”. Again, Ms. Quinn does not disappoint. BRAVO! This story takes place in the early 1950's, with some flashbacks to WWII. The story blends in easily and you become involved in the characters lives. Ian, a British war reporter and his friend Tony are tracking down Nazis and have a special interest in a character called The Huntress. Another character, Nina, is a Russian female fighter pilot, a Nachthexen or "night witch”. who flew planes and bombed Nazis during WWII. Also, Jordan, who lives in Boston with her father and is thrilled that her widowed father meets and marries a German woman, but can't help but think she is hiding something. It took me a while to finish this book as I was savouring it. You know, the kind of book you want to read quickly, but on the other hand, you don’t want it to end. Burning the midnight oil one day, and not touching it the next. Ms. Quinn put in a lot of research to write this book. I love authors who do this and include the facts into their story. It makes you research the actual event, in this case, Nachthexen. Such an incredible event during WWII. If you are into WWII Historical Novels or even if you are not, I highly recommend this book. Compelling, heart wrenching, well written plausible account of war criminals being searched out and brought to justice! Based on some historical truths, Quinn weaves a thrilling story full of very sympathetic characters. Nina in particular is memorable and quite amusing in the end. The story is very compelling and the author built the suspense up admirably. I highly recommend this book.